I must apologise for my silence over the last few weeks. It turned out that being on the road with two children under 5 for over two months can tire you down to the point of catching pneumonia and forcing you to your bed whilst husband and boys happy pootle about in the crystal-clear Sardinian waters! 10 days of antibiotics and 5 days of injections later, here I am again, claiming my spot in the kitchen, craving some home-baked goods. And so, as I walked past the fruit basket in mum and dad’s kitchen, I noticed an abundance of invitingly ripe black plums that screamed for my attention. I had to oblige and marry them with Chianti and spices. I just had to. Cut 5 or 6 black plums in halves or quarters and place in a saucepan with two tablespoons of honey, 2 glasses of red wine ( I used Chianti, as I had some leftover from dinner the night before), a cinnamon quill, a split vanilla bean and a couple of cloves. Half cover with a lid and simmer for around 15 minutes. 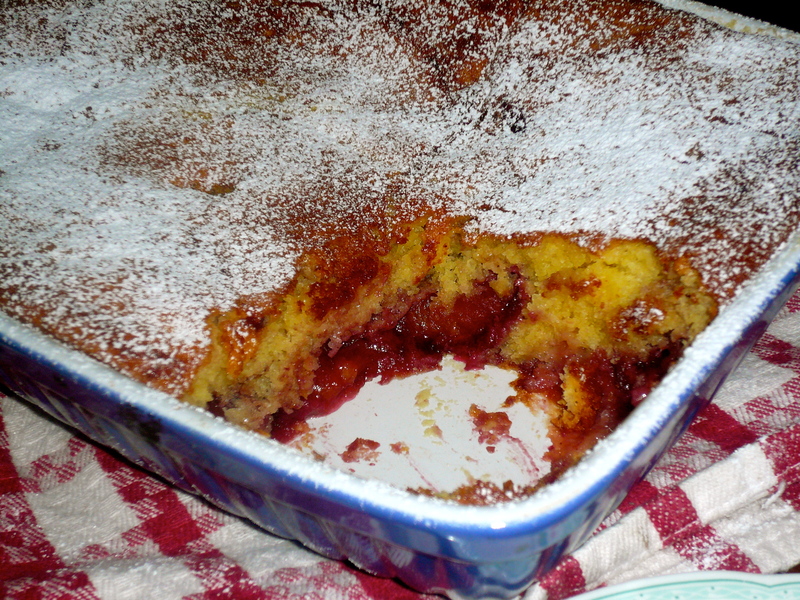 You want the plums to soften but still retain their shape and you want the juice to become slightly viscous and syrupy. In the meantime, make the cake batter. Whisk 3 eggs yolks with 200 of very fine sugar, until frothy and pale. Add 70 ml of olive oil, a teaspoon of vanilla paste and 120 gr of ricotta and beat well until creamy. Gently incorporate 65 gr of almond meal and 200 gr of sifted self-raising flour. Whisk the 3 remaining egg whites until soft peaks appear and fold them into the cake batter. 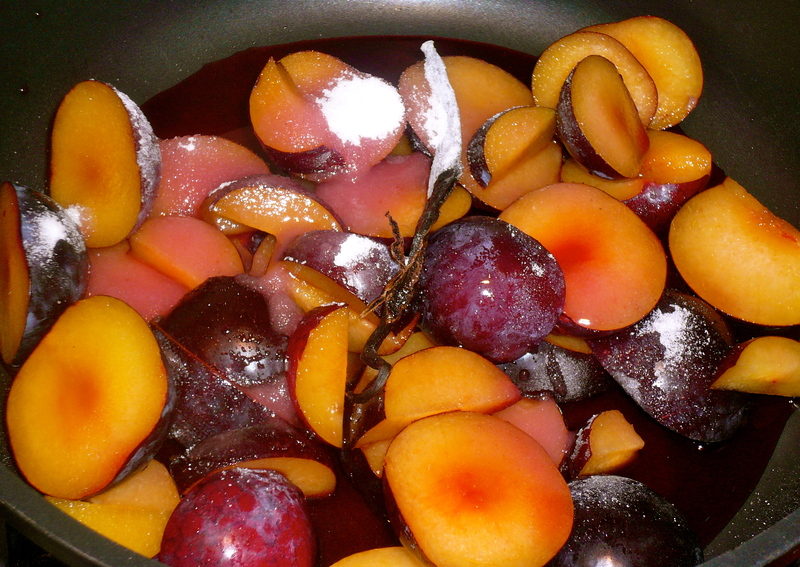 Pour the mix into a greased and floured oven dish, top with the plums and the wine juice. Bake in a moderate oven for about 30 minutes, or until a skewer comes out clean. Ps For those of you in the Southern Hemisphere, please feel free to substitute plums, which are not in season yet, for pears. I love fruit that’s been simmered in wine. This looks wonderful. I love how versatile this recipe is. You can use yellow peaches, blackberries and white wine for a summer version. Thanks Bia! I can vouch for the flavour and texture too…really yummy! almond meal is almond flour. You can buy it at the supermarket, it normally is next to the flour/baking needs.